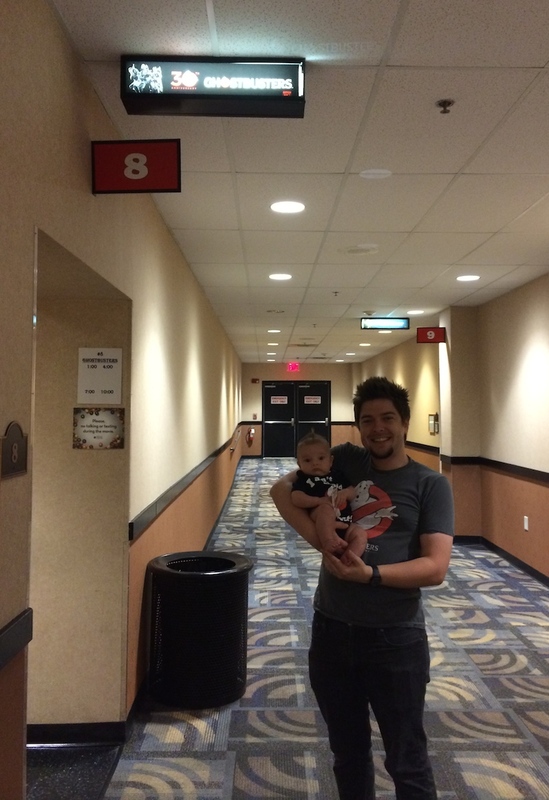 On Friday, August 29, Jay and I took Zach to see his first movie, Ghostbusters. [Side note: I can’t believe that he also turned eleven weeks on Friday…where has the time gone? I don’t even remember the month of July existing!] 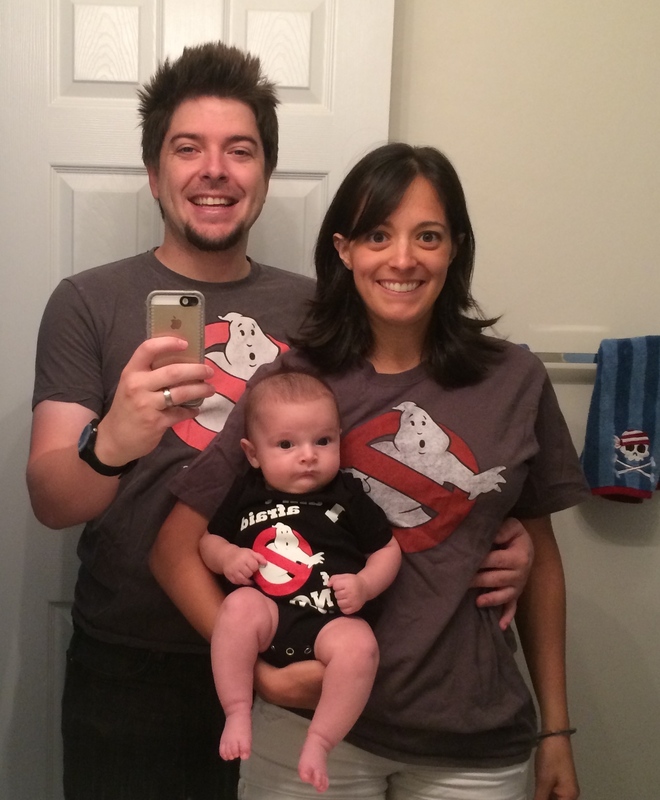 Ghostbusters is Jay’s all-time favorite movie and when we found out it was being re-released in theaters for its 30th anniversary, we knew that not only would we be seeing it, but that it would also be the first movie we took Zachary to see. We got advanced tickets to see the 1:00 p.m. show. We figured that since it was daytime hours during a school day and the Friday of Labor Day weekend, chances were the theater wouldn’t be crowded. Before we left the house, Jay and I decided that naturally, we’d have to be that family who wears matching t-shirts with the logo of a 30-year-movie to see said movie in theaters. 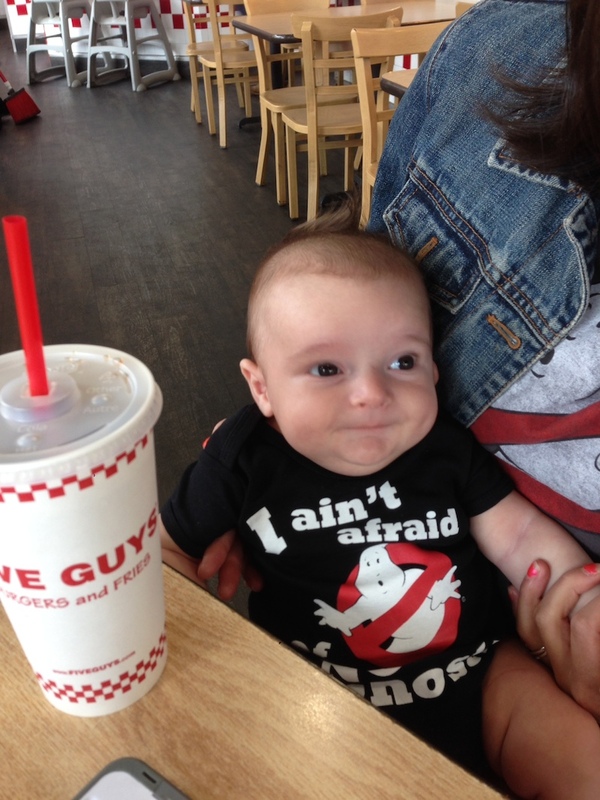 Zach had received two Ghostbusters onesies as presents (THANK YOU SO MUCH Vikas and Bonnie!) in two different sizes and colors, so he was covered. Jay was set because he has like 30 different Ghostbuster t-shirts anyway, so it was just a matter of finding one of Jay’s t-shirts small enough to fit me. Luckily, one did. So, we were all set and ready to start our movie adventure, but not before we (of course) took a picture. Our first stop was another place of firsts: Five Guys Burgers at North Hills, where Jay took me for lunch on the day that we met. Since it is next to the movie theater, we figured we’d be corny and take Zachary to the place where it all started. We took it as a good sign that the only table open when we got there was the table that we sat at when we went there for the first time! We think Zach enjoyed looking around at everything. Actually, he always enjoys looking around at everything and anything. It’s the reason we can’t get him to nap half the time! Anyway, after Five Guys, we headed to the theater. Jay carried him in as I snuck my Five Guys soda in using the stroller 😉 and we explained to him what we were doing and he was looking at. Once we reached the theater it was showing in, we had to stop for picture time. The best part was when Jay held up the tickets to pose them next to Zachary and he grabbed them to hold himself! He’s such a smart kid. Jay and I took Zachary all the way up to the back of the theater. We were still a little nervous about having an 11-week-old in a movie theater, but luckily, we were the only ones in there until during the trailers, when another guy came in and sat right in the front. We picked the last row just in case we had a breast feeding emergency (we had brought a bottle, but wanted to be prepared in case he either went through it quickly and was still hungry or for some reason didn’t want it). 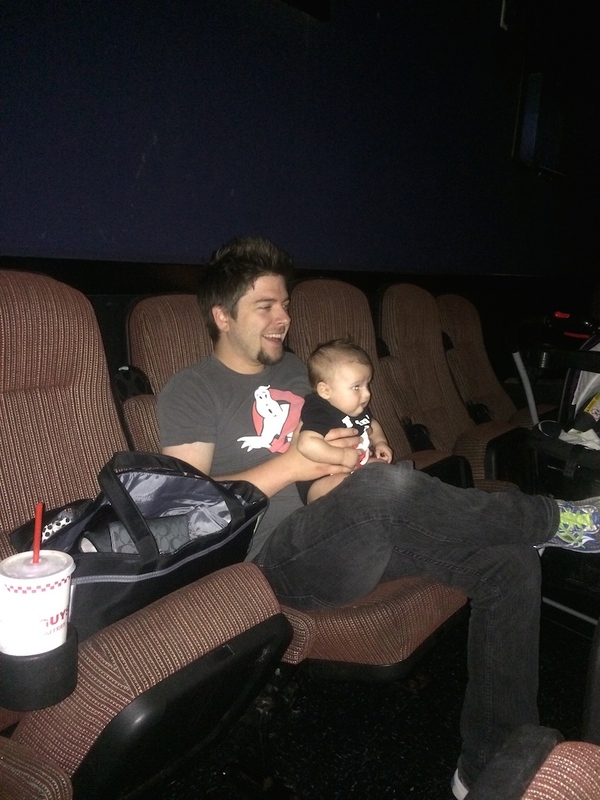 Because we were the only ones in the theater, I took a picture of my boys watching the screen as it started. Heart <3. 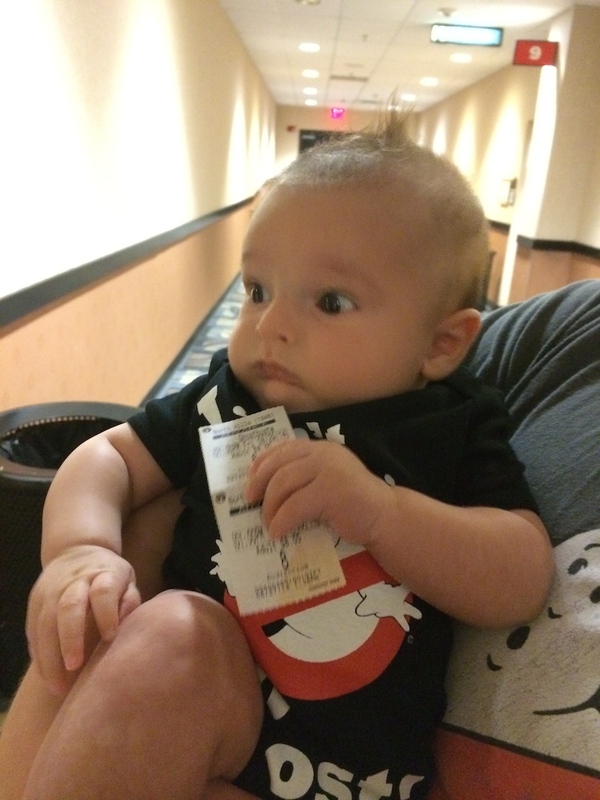 So how did our 11-week-old son do during his “first” movie theater experience? Great! We feed him as the movie started in the hopes he would stay happy and get sleepy (seriously, the kid does not like to nap!). The only time that he cried was while he was sitting on my lap, “watching” the screen after eating and had some gas. Once he was burped, he did really well. We were pretty vigilant about attending to him as soon as he made a peep, haha, but we were both really pleased with how well he did. A couple of fussy noises here and there while he was napping, but each time he fell back asleep when we rocked his carrier. I think it helped that we could put his car seat carrier in a seat and face it away from the screen, so it was dark for him. Either way, he was a really good baby and Jay and I were two very relieved parents. 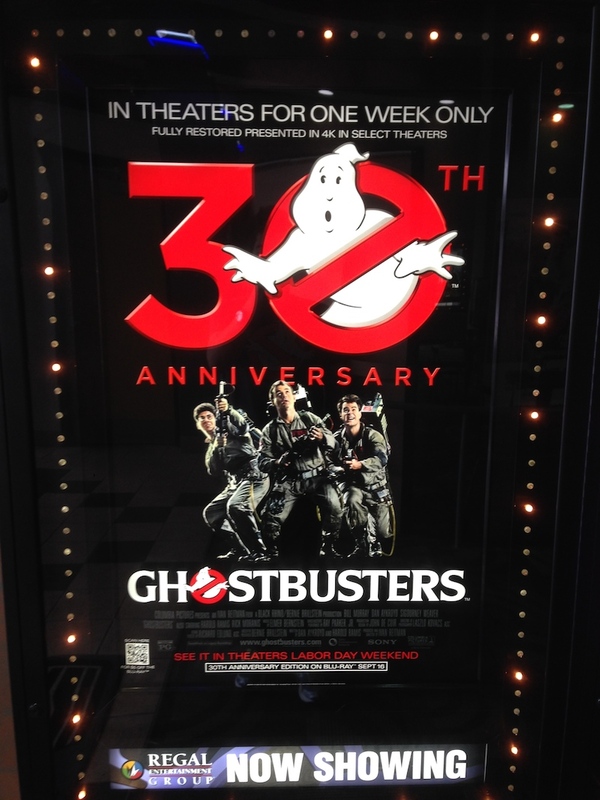 This entry was posted in Jay Glatfelter, Movies, Zachary and tagged Ghostbusters, Ghostbusters 30th Anniversary. Bookmark the permalink.